Please take note that I incorporate treatments according to your skin problems. For more treatments, come and schedule your appointment now. 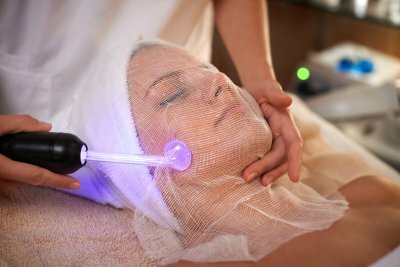 Microdermabrasion/Diamond Peel is a procedure that exfoliates and removes the superficial layer of dry, dead skin cells. It's usually done to the face, chest, neck, arms or hands. Before we can understand how microdermabrasion does what it does, it's important to understand how skin works. Your skin is made up of two main layers, the epidermis and the dermis. The epidermis is the layer closest to the outside world. It's a set of dead skin cells on top of another layer of cells that are in the process of maturing. The topmost layer is called the stratum corneum. The stratum corneum mostly acts as a barrier between the outside world and the lower skin layers. It keeps all but the smallest molecules from getting through. It is one of the easiest and most effective anti-aging treatments you can get. Its softens fine linesand wrinkles, helps to smooth coarsely textured skin, decreases the appearance of scarring, decreases pore size, andreduces superficial hyper-pigmentation, also known as age spots. It is the combination of oxygen under pressure and modified hyaluronic acidcreates a visible result you can instantly see and feel. Additionally,the application of pressurized topical hyperbaric oxygen increases the absorption of the Infusion which helps the skin retain hydration andmoisture. Once hydration is balanced your skin will look and feel healthier and more vital – additionally many other common skin complaints will naturally disappear. “Oxygen is a necessity if you want to have healthy, youthful looking skin." This facial treatment is great because it helps protect and reverse damage from environmental pollutants that can harm our skin. It also helps the overall texture of your skin, which feels smoother after this facial. 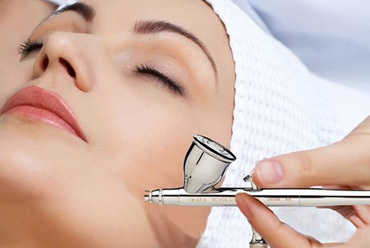 The oxygen facial reduces the appearance of lines and wrinkles by releasing moisturizers onto the skin, which absorb quickly with the help of oxygen. It's an ultimate hydrator that infuses vitamins and nutrients into the skin." Photo Light Therapy is a type of skin care technology used for acne and anti-aging purposes. Recommended by dermatologists, Photo Light Therapy is often referred to as IPL, LED treatment, blue light treatment, photo rejuvenation, or photodynamic treatment. Typically Photo Light Therapy is found in two types: red light or blue light. 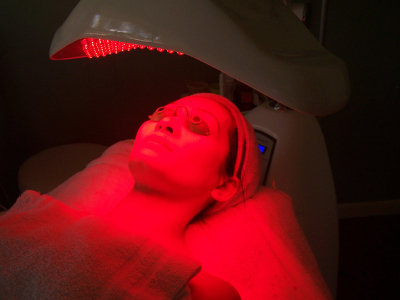 Blue light treatment helps to treat acne causing bacteria while red light helps improve skin tone and reduce redness. Red Photo Light Therapy is characterized by longer wavelengths (also referred to as far infrared) that penetrate deeper into the skin, heating it from within and stimulating the production of collagen. This type of Photo Light Therapy creates new, healthy cells that crowd out inflamed, infected cells, leaving skin clearer and brighter. Regular use of Photo Light Therapy is a great way to get firmer, younger, healthier looking skin without the need for medications or harmful chemicals, but can be used in conjunction with other forms of treatment. With the many types of Photo Light Therapy devices available, it is easy to find an affordable yet effective light therapy device to help solve your acne problem. impuritirs such as blackheads, whiteheads, milia, treating of zitz, cystic acne, acne vulgaries by a powerful RF device tokill bacteria, inflammation, and swelling. Ms.MC understands that not all acne is created equal, so she will work with you personally to give you the best acne treatment that fits for your acne type, severity and lifestyle. With all body treatments and in particular G5, due to its lymphatic cleansing effect, it is highly recommended that you drink water before and after each treatment. G5 is excellent for toning, increasing circulation and to aid inthe breakdown of fatty deposits and cellulite. Particularly good for back, shoulders, thighs, hips, buttocks and stomach. This treatment includes thorough cleansing and exfoliation, steaming to open and unclog pores. Extraction of comedones such as blackheads, whiteheads, and milia, followed by Blue LED light therapy. The treatment will help restore a healthy glow and even skin tone. This treatment is common to celebrity people from the Philippines, just to maintain and have thorough cleansing of their face before shooting, pictorials, or if there's any event.